My long wish to call all the jeepers for an OTR in JAWADHU came near to reality last weekend. I heard Ashwin of Krishnagiri interested in organising an OTR in a riverbed and asked him to change the venue to Jawadhu so I can organise the rest of the program. Though my previous attempts in Jawadhu showed a good trail, but they converted into tarmac in fasttrack by government leaving me with no option but to find new offroad streams. Hence the last weekend trip was RECCE III for me, however lots of good Jeepers from Bangalore turned to support me. Myself and Anjan (The founder of Jeep Thrills, India) jumped onto my Jeep last friday evening and cruise toward my home town. As per our plan we wanted to stay overnight at Tiruvannamalai and proceed towards Chengam to start the offroading in the early morning. Dr.Jones joined us at Tiruvannamalai in the next morning, so My Explorer and Dr. Prowler (both our vehicles had experienced Jawadhu on the first RECCE) started to move towards Chengam. I was expecting around 2-3 Jeeps from Bangalore along with Ashwin's Gypsy from Krishnagiri. 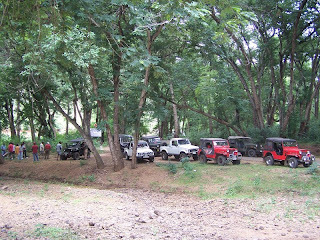 We were surprised as many as eight capable offroaders turned out to Chengam. I was bit happy but really worried about organizing their comfort zone. However I had strong belief in Jawadhu hill top as we get everything out there. We all had our quick breakfast and one of the bangalore Jeepers Armada got the rear suspension cut, we were forced to send him to my hometown as that is the nearest place he can get the suspension fixed. The rest of the nine vehicles started moving towards the start point of the hill climbing task. It was secnic yet undiscovered, beautiful but not tourist attraction a couple of words to describe about the Jawadhu Hills crawling path. This path was made during the british colonial time and abandoned for public use. 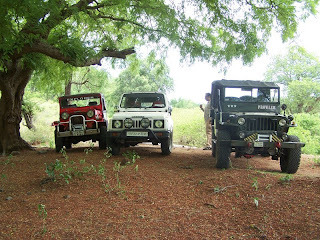 We slowly pushed the offroaders on bad roads / offroads and no roads condition, the altitude was slowly rising and shades of green under the tyres and upside the hood was shown. 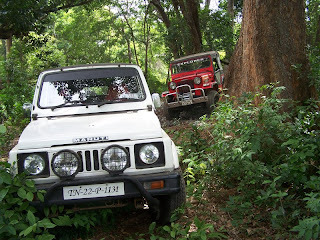 It was great as the toughest souls which drove the favorite offroaders gone fyling on the trail. It was around 36 kms of no road condition where the Vehicles travled. We reached our favorite water stream crossing, but to our shock no water was flowing on the water body. But we found a bit of water stagnated and you know what, the brand new Gurkha which traveled along with us took the challenge to float on the water. I must admit the Gurkha is really capable and I set my mind for Gurkha if at all I'm buying a new car in the near future. It had cool and solid metal body, latest engine, power steering, A/C, power window and independent front suspension along with Differential lock and Four Wheel Drive option. So what else we need, the owner of the Vehicle really cool and he took a brave decesion to get on to the water. The rest of the story could be seen from the below pictures. We reached the hill top at around after noon and after the lunch we moved toward the observatory, Since Bangalore Jeepers came with a Time restriction they were pushed their jeeps towards bangalore on the same night. Myself, Dr.Jones and Ashwin (Mahindra Classic, CJ3B and Gypsy) were set our goals for the 2nd day RECCE on this phase III. Since Ashwin is first time offroader Anjan and Dr.Jones decided to teach him a offroad technique. Whats then, they bypassed the hairpin bends on the hill roads with the four wheel enabled vehicles and Ashwin followed them. Oh yeah he got stuck once, but we were equipped with Winches in our Jeeps so recovery was instant. During the winching operation I noticed Dr.Jones Jeep's fuel meter showing down, I informed him but we really didn't took it serious. 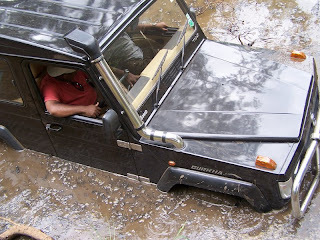 We were roaming on the forest roads to find our next trail and Anjan spotted a obstacle which looked almost impossible for me and he asked me to do, I really refused to do and asked him to take my jeep to try. I thought he will not be able ot go even 2 feet on that obstacle. 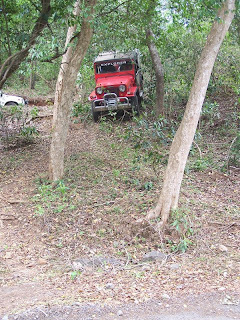 He was so skilled, took the jeep through that very narrow incline with great rocks created toughest obstacles. Unfortuntely my jeep lost the trackion on the top where he about to reach the road. Again we had to winch out, however the stunt was so good. Dr.Jones didn't take his jeep on to it as we feared the nil fuel condition may stall the jeep while going up on the obstacle. But later in that same day, when we reached the fuel pump we found that his fuel tank was half full and the real issue was in the fuel guage. We had marked few good streams while driving toward the downhills and decided do the RECCE on another day as we always thought Prowler was running out of Fuel.